Your body is supported on its feet as in standing, yet is folded up and compressed as much as possible. This eliminates virtually all points of swaying and motion above the ankle joints. The elbows are partially but adequately supported by the inside of the knees. The sight line is low, so watch out for vegetation. The wider your feet are planted, the more stable the stance. Due to the small base of support, heavy recoil may knock you right over. Not long into my marksmanship journey, I was competing in a local two-gun match in Montana. About half of the competitors came from the local Air Force Base, like me. The other half drove in from about a 100-mile radius. During one stage, there was a target about 400 meters away. The grass was too tall to shoot from prone, and we were not allowed to rest the rifle on anything. Most shooters dropped to a kneeling or sitting position. I took a different approach. Once I reached the firing position, I dropped directly down into a squat. With both feet planted flat on the ground and both elbows supported, I landed the shot in far less time than the guys who knelt or sat. Several of the younger shooters had never seen the position before, and the older range masters nodded in approval. I didn’t win that day, but I walked away with a little pride in knowing I helped others learn a little bit. The squatting position, otherwise known as “Rice Paddy Prone,” isn’t as common as it once was. It is a moderate stability position that supports both elbows, making it more stable than kneeling yet keeping a high level of mobility. Its higher center of gravity will still be less stable than sitting or prone, though. It was a traditionally taught marksmanship position but lost popularity after the Korean conflict. It’s been left out of military marksmanship manuals for a long time, though still taught in some shooting and big game hunting schools. The position returned in the 2016 edition of TC 3-22.9. I asked Ash Hess, the senior author of TC-3-22.9, why the position disappeared and came back. He relayed that it fell out of favor following Vietnam and faded from memory since we moved on to different styles of warfare. Squatting returned to the manuals in 2016 after experiences in the swampy terrain of the Arghandab Valley in Afghanistan. There were similar experiences in the river valleys of Iraq. Squatting is very quick to drop into and get out of, depending on your personal mobility. Sadly, many people today are not able to use this position without difficulty. It requires a good bit of flexibility and muscle tone to use it effectively. TC 3-22.9 notes that you can increase stability a bit by rotating the rifle slightly until the magazine presses against the inside of the forearm. Here is the diagram from the training circular. The squatting position as depicted in TC 3-22.9. If you notice point number four, the firing elbow, the TC states that the firing elbow is placed on the outside of the firing knee. That is different than what I stated above. The truth is that you’re going to end up doing what works best for you. These are a few pictures of me using the squatting position. I circled the supporting elbow with red to highlight a common mistake. The meaty portion of your tricep should be on the inside of the knee, not resting in front of or on top of the knee. Kyle Lamb, in Green Eyes Black Rifles, points out that the squat is an excellent position for hunting big game in a marshy environment. It’s fast to drop into, but it also has a limited arc of engagement. In other words, it is more difficult to adjust your point of aim left to right. The squat works best for single targets in front of you. Jeff Cooper, in The Art of the Rifle, as well as Pete Lessler (quoted at the beginning of the article), both caution you about heavy recoiling rifles. The somewhat narrow base and higher center of gravity mean less recoil control. 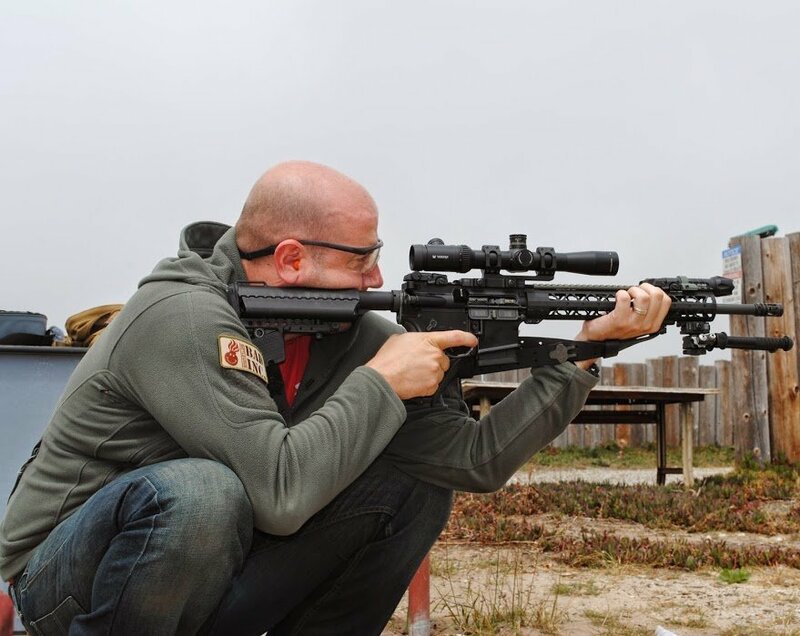 If you plan on using heavy caliber rifles, such as dangerous game hunting, then widen your stance a bit before dropping into the position. It is also known as the “Indigenous People’s Stretch” in fitness circles. The defining feature of this style squat is that your heels remain on the ground. When most American’s squat down, they balance up on the balls of the feet. That kind of instability isn’t going to work for marksmanship. The big limitation for people comes from the flexibility and health of joints. Knee problems will certainly limit how much time you can spend in the squatting position. More specifically, lack of flexibility in the hip, ankles, and lower back will make it very difficult to attain, hold, and balance the position. These elements can be worked on through an effective strength and flexibility program. The video below is long, at around 22 minutes, but it’s a great breakdown of ankle flexibility and how you can improve it. If your problem is hip mobility, here’s another video from the same series showing how to work on it. Lastly, if you would rather look for a book to help explain all of this, I highly recommend Becoming a Supple Leopard by Dr. Kelley Starret. The squatting position becomes more difficult depending on my gear. If I’m wearing a battle belt or anything bulky around my waist, any tall objects in the front will get in the way. One solution is to “hike up” the belt just before dropping into position, but that isn’t ideal under time pressure. A chest rig that rides nice and high works great for the squatting position, though. The squatting position is worth the time and practice. For a long time, it was my best position when not in the prone. I found that my scores were often better than sitting, and significantly better than kneeling. It is eye-catching as well since you rarely see anyone at the range using it. Whether it works for you or not, it’s always nice to have another position in the toolbox. I may need to get a copy of that book, Becoming a Supple Leopard by Dr. Kelley Starret. Oh yeah, it’s a great one. Highly recommended. are mostly what keep us from getting our heels down and feet flat on the ground. Spending time attempting the position will get that stuff slowly stretched out. Oh yeah, there’s no substitute for actually practicing something. It’s funny in a way, because I got better at squatting like this due to practicing marksmanship. But when I would be working out, people assumed I was just more flexible than them and specifically trained for the flat foot squat. Should You Buy a Nitrided Barrel for Your AR-15?